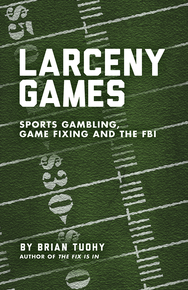 Author Brian Tuohy joined Stephen to talk about his new book, Larceny Games. It is based on over 400 FBI files and numerous interviews with FBI Agents, sports gamblers and bookmakers. Brian will be discussing the world of sports entertainment and how it is not a pure as most fans envision. Professional leagues have argued in court that they are entertainment, not a sport and if they are entertainment, the pro leagues must make sure the product is entertaining with the right actors in the show, right? Sport is the purest form of competition and elite performance, right? Brian will break it all down and share his thoughts on events that have taken place in recent times that will challenge your viewpoints on the role of sport in our society. Brian will be making an appearance at the Twin Cities Book Festival on October 12, 2013 in the Local Lit Lounge at 4pm. Check out their website for specific times and locations. For more information on Brian Tuohy, visit his website. Brian Tuohy is America’s leading expert in game fixing in sports, having written about the subject for more than a decade. He is best known as the author of The Fix Is In: The Showbiz Manipulations of the NFL, MLB, NBA, NHL and NASCAR which was published by Feral House in 2010. The book gained national and international attention as it was reviewed by the Wall Street Journal, the nationally syndicated The Bookworm Sez, the Independent in the United Kingdom, and Milwaukee’s Shepherd Express among others. This entry was posted in baseball, basketball, football, hockey, Soccer, talk radio on October 2, 2013 by admin.